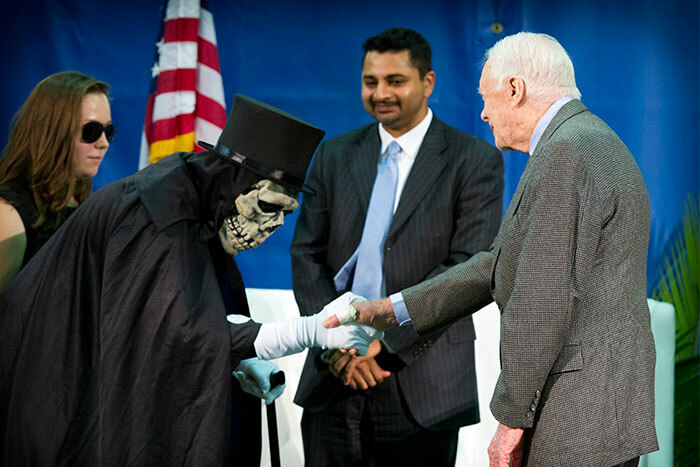 President Jimmy Carter is greeted by Dooley, Emory's unofficial mascot, at the start of the 34th annual Carter Town Hall. Declining a provided chair, President Carter chose to stand at the podium to field questions submitted by students. Students rose as their questions were asked, while audience members frequently applauded Carter's frank, engaging answers. 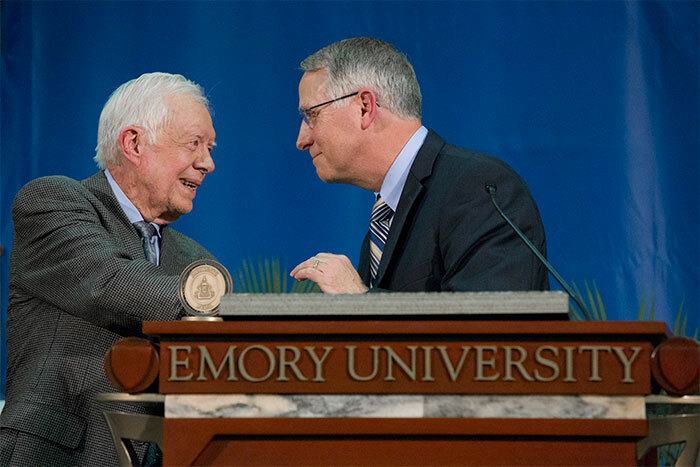 At the conclusion of the Town Hall, Emory President James Wagner presented Carter with the President's Medal, which honors those who have "advanced human understanding and advanced the cause of peace." "It is more blessed to give than to receive, so I ask that you would bless us by receiving the President's Medal," Wagner told Carter, who later left the stage as he entered it — accompanied by a standing ovation. VIDEO: Watch the entire 34th annual Carter Town Hall. 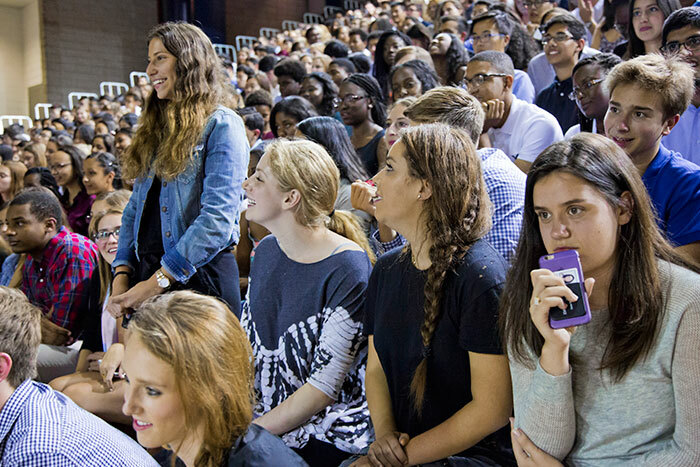 For 34 years, former U.S. President Jimmy Carter has joined first-year Emory students for the annual Carter Town Hall — a spirited, no-holds-barred conversation that has become a coveted rite of passage for the university’s newest class. And Wednesday night’s event was no exception, as Carter genially tackled every question put to him. But this year, the always-popular gathering took on a new resonance. Last month, the 90-year-old international statesman, Nobel laureate and human rights advocate announced that he had been diagnosed with metastatic melanoma and would be undergoing treatment at Emory’s Winship Cancer Institute. To counter that image, he announced that instead of sitting in a chair that had been provided, he would stand to answer questions for the next hour, drawing a roar of support from the crowd of about 1,300 Emory students. Many expressed gratitude for a rare opportunity — the chance to see someone with Carter’s international experience chat informally about issues large and small. “For me, personally, it’s just very exciting to see a piece of living history,” said Amy Mathews, a freshman majoring in classics and anthropology. For Cana McGhee, a freshman majoring in music and math, the Carter Town Hall was a must-see event that held a heightened importance this year. Four years ago, Tom Cassaro was a freshman attending his first Carter Town Hall. “I’m very interested in political science and social change,” said Cassaro, a post-graduate fellow in the Emory Scholars Program. In remarks before taking student questions, Carter assured the crowd that he is doing well. "I'm in good spirits; I'm prepared for anything that comes," he said. "My wife has been a little bit less prepared than I, but she's getting on fine." Emory College of Arts and Sciences Dean Robin Forman said the Carter Town Hall offers “a remarkable opportunity for students to hear directly from someone with the breadth of experience that very few people have ever had — not just as a president, but as an active statesman who is still traveling the world, facing pressing global issues, with an unquenchable thirst to know, access to information and a willingness to share his insights." The non-profit Carter Center is an affiliate of Emory University independently governed by a board of trustees that includes appointees from both The Carter Center and Emory, with Emory President James Wagner serving as an ex-officio member. Its programs focus on advancing human rights, presenting and resolving conflict, enhancing freedom and democracy, and improving health worldwide. As an Emory University Distinguished Professor, Carter has maintained a direct relationship with the university, engaging in the lives of Emory faculty and students since he accepted the position in 1982. At the conclusion of the town hall, Wagner stepped forward to award Carter with the President’s Medal, an honor Wagner said is intended "to recognize those who have, through art and/or intellect, advanced human understanding and the cause of peace." Wagner noted that the medal had only been awarded four times during his 12-year tenure at Emory. 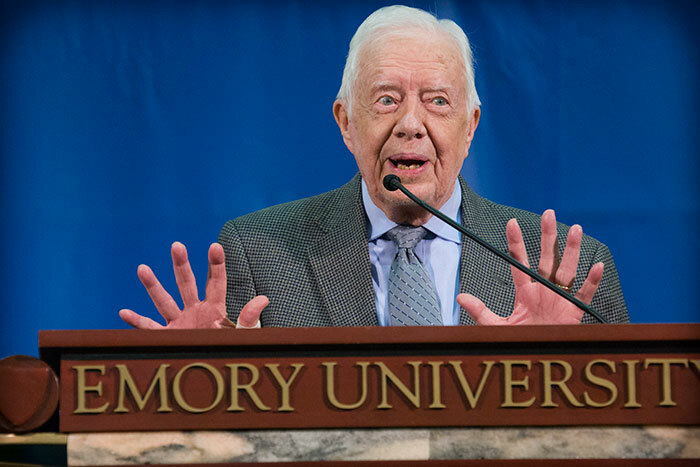 When Carter was asked about his favorite memory of his time here at Emory, he reflected on the pleasures of dealing with “enlightened, gifted” university presidents, professors and deans, as well as the opportunity to teach in classrooms across the university. 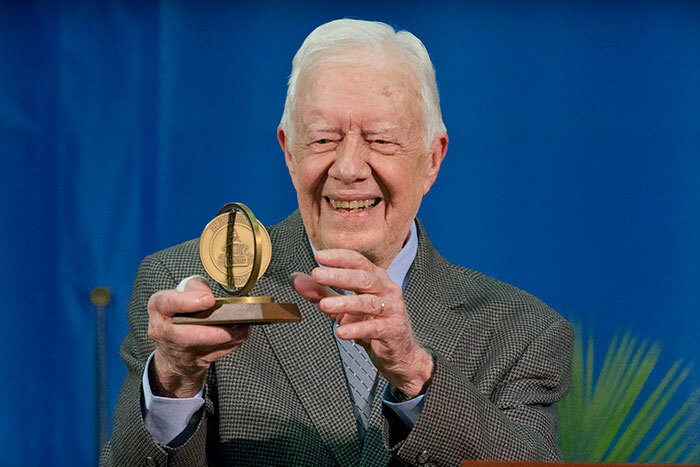 “The partnership that has grown between The Carter Center and Emory University, and myself and Emory University, has been one of the highlights of my life,” he said. Carter holds the record for the longest post-presidential career of any president, winning acclaim for his humanitarian work, including receiving the Presidential Medal of Freedom, the country's highest civilian honor, in 1999 and the 2002 Nobel Peace Prize. During the hour-long town hall, he drew on those experiences in addressing student questions that covered everything from current political crises to his relationship with his wife, Rosalynn, to whom he has been married for 69 years. What is the first thing you say to your wife in the morning and the last thing you say before you go to sleep? Carter recalled how, shortly after leaving the White House, he forgot his wife's birthday and quickly wrote a card promising to grant any wish she had. "Now for about 30 years, usually the first time I see my wife in the morning, I take her a cup of coffee and a glass of orange juice, and she repays me with a kiss and we tell each other we love each other, and that is how we start our day," he said. The couple has kept their partnership strong for nearly seven decades by following two rules: giving each other space to do the things they like while finding things they also like to do together, and never going to bed without resolving any disagreements of the day, Carter said. "So the last thing we do each day is read the Bible together — one night I read the Bible, and the next night Rosalynn reads the next part of the Bible — and most of the time we do that in Spanish just to practice our second language," he said. What national issue should every 2016 candidate, regardless of political affiliation, be aware of in this election cycle? "I would say that the new president should resolve in his or her heart: I will keep my country at peace, and I will be a champion of human rights. That would be the two things that I would insist on if I had influence on the next president," Carter said. What should be done at the governmental policy level to address mass incarceration and its accompanying racial inequalities? "The imprisonment, and executions as well, are primarily concentrated on poor people and I would say primarily African Americans and others who may not have access to the highest level of legal protection if they are accused of a serious crime," Carter said. "So we have a destitute and very improper, and I'd say an almost illegal, system of justice in this country where poor people basically serve their sentences and are executed for crimes and rich people get away with their crimes. … That is something that needs to be drastically changed," he said. What do you believe is the right course of action for dealing with issues in Iraq and Syria? "The primary issue in Iraq and Syria now is the advent of ISIS, or the Islamic State, and that has been caused primarily by the lack of concerted effort to end the war in Syria," Carter said. Carter said he met with Russian President Vladimir Putin a few months ago and relayed to President Obama that Putin recommended having a conference convened by Russia and the United States, and also including Iran, Saudi Arabia and Turkey, to work out a possible solution to the Syrian problem. "The problem now is there is no compatibility between all of us who have ISIS as the top threat to peace in that part of the world, and a threat to the whole world, because we are working at cross purposes," Carter said. "If we could get together … what they would work out as a solution would be the best approach." What advice do you wish you had received before going to college? "So with the extremely high level of freedom that you will never experience again in your life, and with the turmoil of thoughts and ideas that can come to you from yourself and other people at the university, this is the best time for you to shape the highest possible moral and ethical ideals for yourself for the future." When faced with adversity, what motivates you to persevere? "Everybody goes through times of success and failure, and achievement and disappointment, of happiness and sadness, and then all of us have to face the prospect at the end of our life of death," Carter said. He noted lessons he learned from his parents, his education and service in the Navy, and in the political arena, before discussing his religious faith as the best "single answer" to the question. "When I reach adversity, I turn to prayer," Carter said, "and I realize that my creator gave me both life and certain talents and abilities, certain opportunities, and also he gave me freedom. "With a combination of life and freedom, I feel reassured and I know that when I need a partnership in a time of adversity, I have a partner available to me who knows everything and can do anything."